Graduating another cohort of young engineers and computer scientists is a momentous occasion, and with a little organization and need-to-know information on the big event, the day will be smooth and seamless for students and their families. 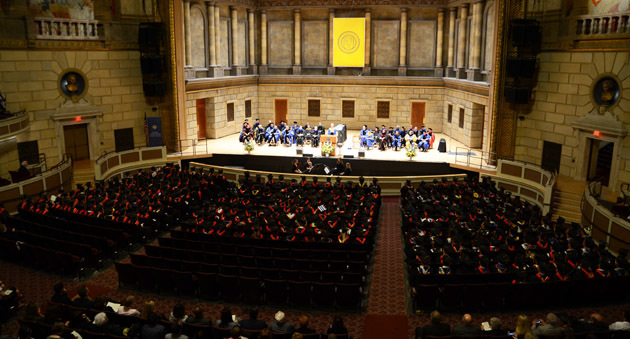 For the master's and PhD ceremonies, the Arts, Sciences and Engineering ceremonies, and university-wide commencement information, please refer to the University of Rochester's Commencement website. The first 100 graduating seniors who attend the Hajim School Diploma Ceremony Rehearsal will be given parking vouchers for the East End parking garage (a $7 value) for this year's Hajim School Diploma Ceremony. The rehearsal will cover logistics of the ceremony, including lineup beforehand, processional, awarding of diplomas, and recessional. Round-trip transportation to the rehearsal will be provided by chartered buses that will depart ITS Center at 3:30 p.m. to the Eastman Theatre. They will return at 5:30 p.m. Students may also take the 3:15 p.m. Red Line shuttle from Rush Rhees Library to the Eastman Living Center (arrives at 3:35 p.m.) and return on the 5:05 p.m. shuttle from the Eastman Living Center to Rush Rhees Library (arrives at 5:25 p.m.). Some professions have rites of passage marking one’s entrance. The Order of the Engineer ceremony is often considered the rite for engineers. Formed to provide a sense of closure at the end of your engineering studies, the ceremony gives a visible means for students graduating from programs accredited by the Engineering Accreditation Commission of ABET, (BME, CHE, ECE, ME, and OPE) to identify with other engineers. Pastries, coffee, Senior Design posters. For shuttle bus service see parking and transportation. Although tickets are not required for this event, to ensure sufficient food and seating we do ask that graduates RSVP to their undergraduate coordinator with an estimated number of participants and dietary restrictions no later than May 1. The menu will consist of stations of cheese, barbecue foods, and desserts. Wine and beer will be available for purchase. Students, family, faculty, staff, and alumni are invited to this school-wide barbecue picnic. Individual diplomas will be presented at this ceremony. Tickets are not required. Please note: the doors to Kodak Hall will not open before 2:15 pm. The Eastman Theatre is equipped for people with mobility concerns. Upon arrival, persons needing assistance should request assistance from a Theatre usher for access to elevators and wheelchair seating. The ceremony will also be simulcast in Kilbourn Hall at the Eastman School of Music. Please review four things you need to do ahead of time to ensure your graduation status and to assist us in planning the ceremony. Graduates must arrive at the Eastman Theatre and be fully gowned by 2:30 p.m.
We have made arrangements with GradImages to take three photographs of every graduate. Candidates have the option of purchasing photographs, however there is no obligation to do so. Visit GradImages to register and receive a coupon to save 20% off! Continuous shuttle service will be provided from 7:15 a.m. to 6:30 p.m. between the River Campus (Library Road entrance, Rush Rhees Library) and the Eastman Student Living Center. Parking for the Hajim School Diploma Ceremony is available for a fee in the East End Garage or in the Allpro Parking Lot. For more information see driving directions to the Eastman Theatre.